You may not be an anatomy expert, but chances are you know exactly what the ulnar nerve is if you've ever hit your "funny bone." If you hit the right spot on your elbow you'll actually hit the ulnar nerve and feel a strangely painful sensation shoot down the outside of your arm and into your fourth and fifth fingers. Hitting your "funny bone" isn't very fun, and neither is pinching your ulnar nerve while bench pressing. The ulnar nerve branches out from a collection of nerves called the brachial plexus. The brachial plexus comes out of your neck and goes towards your shoulder. The ulnar nerve branches away from the brachial plexus between your neck and shoulder. It runs through your shoulder and down the inside of your arm. It snakes under your elbow and runs down the back of your forearm, along your ulna, which is the bone on the pinky finger side of your forearm. The ulnar nerve runs all the way down into your ring and pinky finger. At your elbow, the ulnar nerve goes under something called the cubital tunnel, which is a band of tissue that pins it against the elbow. It travels over your medial epicondyle, which is the inside part of your elbow that sticks out. This part of the ulnar nerve is known as the "funny bone" and is more susceptible to being hit than other parts because it sits right on the surface of the elbow, completely exposed. The part of the ulnar nerve that goes around the elbow is prone to injury and irritation because it can get trapped in a little groove in your elbow. It can also get trapped under the collar bone or in your wrist and become irritated, notes the American Academy of Orthopaedic Surgeons. Repeatedly bending your elbow can cause the ulnar nerve to swell up. The nerve can also slide in and out of its groove on the elbow, causing irritation. 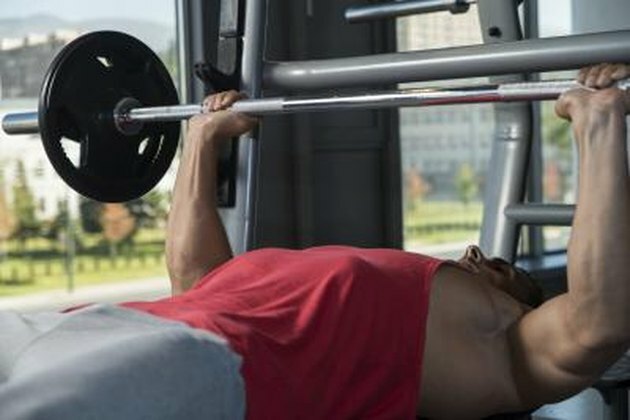 The bench press can cause either scenario because your elbow goes through over ninety degrees of range of motion during the movement. 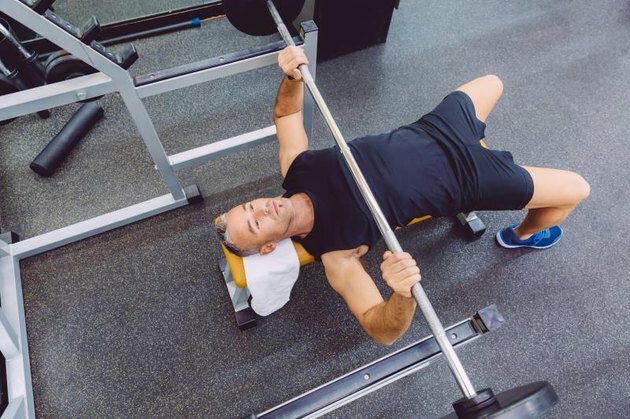 Repeatedly bending your elbow in the bench press would cause the nerve to become inflamed and you would feel symptoms. When your ulnar nerve is damaged or trapped, you're going to notice it. You might have weakness or tenderness in your hand, tingling in your ring and pinky fingers, and tenderness at your elbow. Not only will this feel uncomfortable, it can affect your bench press because it will make it difficult to grip the bar and to press weight. If you're experiencing these symptoms, you have a few different treatment options. This injury often gets better on its own if you let it rest. If not, your doctor might tell you to take over-the-counter, anti-inflammatory drugs or a corticosteroid shot to reduce swelling. A doctor might also ask you to wear a splint to prevent the elbow from moving so that the nerve can recover. You might also be sent to a physical therapist, who will evaluate the injury and give you rehab exercises to get you back to bench pressing.